Many Samsung employees will evidently be using the new Galaxy S10 handsets before they’re made official to test the handsets in the real world. It often happens that someone slips up. Or they don’t pay too much attention to their surroundings and that results in pictures like this. 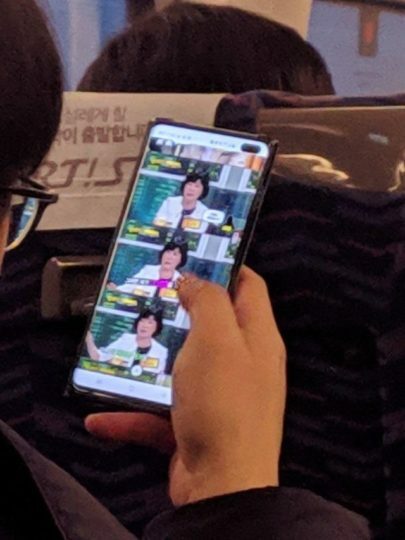 It seems someone was spotted using the Galaxy S10+ on a bus in South Korea. Going by the image, it’s likely the Galaxy S10+, given that we can see a dual camera at the front. The cutout for the camera is in the top right corner as expected. This picture surfaced on Reddit earlier today with no explanation from the original poster. A commenter claims to have one also. He says that this is likely a worker on the bus to or from Samsung’s Suwon campus in South Korea. He further points out that the security case has been left on the device, the flip cover has been folded on the left. This employee has apparently removed the security software that puts a “watermark/employee+deviceId on screen.” The commenter says that employees tend to get in a lot of trouble for doing this. When asked about their assessment of the device, he says that the device is about the same size as the Galaxy Note 9 but feels lighter than it. Facial recognition is said to be working better than previous generations. The in-display fingerprint sensor has been given a thumbs up as well. When asked to comment on the actual feel of the device, he expresses his inability to do so. He says the device will lock up if an attempt is made to remove the security case. All of this does sound plausible and the device in the image isn’t all that different from the renders of the Galaxy S10+ we have seen so far. However, it does appear suspect enough to be not taken at mere face value. And what to say of claims made by an anonymous commenter on Reddit? It won’t be long now before all of the details are officially revealed. Samsung is set to unveil the Galaxy S10 on February 20. Do you like what you see so far? You might be right. No one makes such a bad quality pictures anymore. So it must be a marketing thing to hype things up. Lol looks even worse than I feared. I’m not buying this piece of crap. Why not the middle, I don’t mind the pill cut out but it would look world’s better with the cut out centered. It’s orchestrated .Totally done on purpose to keep the media chat going constantly going. I don’t like the hole though. I’ll be keeping my S9 plus until S11 anyway, but I definitely wouldn’t buy this with that hole. Hopefully it will be gone on S11. Probably a photoshopped photo, there’s no chin!! Why there;s no leaks about foldable smartphone ? Yeah, I would also prefer a thin bezel till the indisplay front facing camera tech is ready (that sits behind the screen) or something similar. Not to mention that I am almost 99% sure it will have bigger bottom bezel than the iphone x/xs. The whole point of the notch/cutout is to not have bottom bezel and only apple did it. Still, I don’t like their design either, it’s looks over functionality – small bezels didn’t kill anyone.